Dhaka, 6 Feb, Abnews: Prime Minister Sheikh Hasina today said tourism is one of the areas where Islamic countries can work together to explore greater opportunities and potentials. "Tourism is the fastest growing sector greatly contributing to economy and employment across the world. Tourism is one of the areas where we have greater opportunities and potentials to work together," she said. The prime minister was inaugurating the 10th Session of the Islamic Conference of Tourism Ministers (ICTM) at Pan Pacific Sonargaon Hotel here today. "There are numerous scopes and opportunities around us to work together for the betterment and welfare of the people of Muslim Ummah. In view of the current global scenario, the relationship among the OIC member-states should be based on mutual trust, understanding and cooperation," she said. Minister for Civil Aviation and Tourism AKM Shajahan Kamal presided over the function while State Minister for Foreign Affairs Md. Shahriar Alam, chairman of the Parliamentary Standing Committee on Ministry of Civil Aviation and Tourism Faruk Khan were present as special guests. OIC Secretary General Dr Yousef bin Ahmed Al-Othaimeen attended the function as Guest of Honour while Secretary of the tourism ministry S M Ghulam Farooque gave welcome address. Chairperson of the 9th Session of ICTM (Niger), Representative of UN World Tourism Organization (UNWTO) also spoke on the occasion. 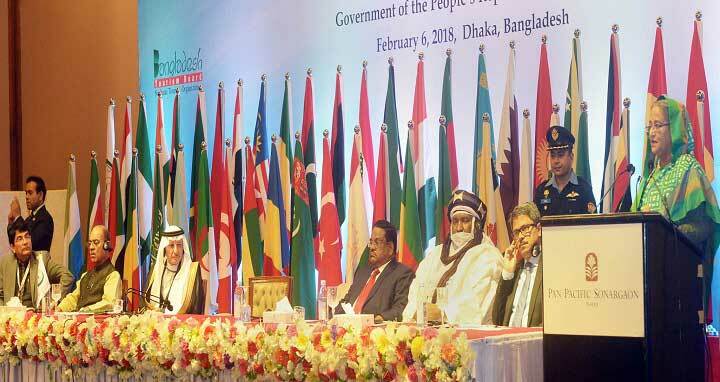 Sheikh Hasina said Islamic Economy has become a new phenomenon. It continues to grow and be operated by the Muslim community around the world. Because of the universal acceptability of the Islamic products and services, and a large consumer community, it has a huge potential to develop faith- based Islamic products and services, she said. "These products and services have become popular even in the non-Muslim communities. We should work together to preserve and conserve the Islamic culture and heritages," she said. Sheikh Hasina said travel and tourism have occupied a significant portion with other Islamic products and services. Halal Foods, Islamic Finance, Halal Pharmaceuticals and Cosmetics, Halal Tourism are some of the growing sectors of the Islamic economy. In order to develop these sectors, member-states of OIC need enhanced cooperation and partnerships both in public and private sectors. The prime minister said Father of the Nation Bangabandhu used to believe in the synergies of mutual cooperation, and being imbued with collective notion, he joined the OIC in 1974. "Since then, Bangladesh continues to maintain friendly relations with all OIC member-states and plays significant role to uphold Muslim Solidarity in pursuit of the great Islamic values of fraternity, justice, cohesion and inclusion as a whole," she said. Terming Bangladesh as an ideal place for tourism the prime minister said Bangladesh has a lot of resources for developing tourism industry. Cox's Bazar, the longest unbroken beach in the world with the longest marine drive, the Sundarbans, the largest mangrove forest in the world and the home of the Royal Bengal Tiger, Kuakata, the daughter of the sea, are the great attractions for the tourists. Bangladesh is a riverine country crisscrossed by hundreds of rivers that have made the land scenic and beautiful. Hundreds of green tea-gardens in the north-eastern part of the country give tourists an exciting natural surrounding for holiday-making. Thousand-year-old historic and archaeological sites, vibrant culture and living heritages are also the big attractions for the international tourists, and above all, the friendly people of Bangladesh, their hospitality and the glorious history of sacrifice for freedom will be the memorable experiences for you, she said. Sheikh Hasina said soon after the independence, Father of the Nation Bangabandhu Sheikh Mujibur Rahman realized the potentials to develop tourism as an economic sector. For this reason, Bangladesh Parjatan Corporation was established in 1972. As an economic sector, the prime minister said, Bangladesh has given tremendous importance and emphasis on developing tourism with formulating a National Tourism Policy in 2010 to ensure sustainable development of tourism. To implement the policy, Bangladesh Tourism Board has been established in 2010. It has been identified as a thrust sector in the Industrial Policy-2010 and the government is providing attractive investment facilities to local and international investors. The prime minister said construction of an international airport in Cox's Bazar, the tourist capital of Bangladesh, is underway. This will facilitate the tourists to fly directly to Cox's Bazar from any part of the world. Cox's Bazar is being connected by rail network also. We are also taking initiatives to expand infrastructural and recreational facilities for the tourists. Besides these, world-class facilities are also being made available in different parts of the country in the private sector, she said. A 6.15-Kilometer-long bridge over the mighty river Padma will create overland connectivity between Dhaka and southern part of the country, including the Sundarbans, she said. Pointing out the theme of the conference- "Promoting Regional Integration through Tourism" she said it is imperative to build an adhesive and cohesive relation among the member states in various fields of economy and culture, including tourism to achieve the goal. Capacity building, knowledge and technology transfer, exchange of expertise, human resources development, occupational skill development, private sector and stakeholders' integration, strong institutional networking should be the prioritized areas to embark on, she said. She expressed delight for selecting Bangladesh as the chairperson of the 10th Islamic Conference of Tourism Ministers for the next two years saying during the tenure Bangladesh will make the best possible efforts to develop tourism in the OIC member-states through integration and networking of all member countries and institutions. "I do believe, Bangladesh would be able to create landmark achievements during its Chairmanship for the next two years," she said reaffirming her government's support and cooperation to the OIC in the field of tourism. She hoped that the outcome of this conference would give guidelines for all member-states to foster greater cooperation and interconnectedness. I wish the conference a great success. Sheikh Hasina expressed gratitude to OIC and other international organizations, and the countries of the globe for their great support to the cause of the Rohingya refugees. Bangladesh has been facing the crisis for years together with the latest influx of forcibly displaced Rohingyas from Myanmar, she said adding that only on humanitarian ground Bangladesh has given temporary shelter to the Rohingyas who fled to Bangladesh to escape the atrocities in their homeland.